We first visited St Trillo’s Well just after Christmas, snow has been compacted into ice on the promenade and access to the chapel was treacherous. Returning last wekend was a much easier and more pleasant walk. 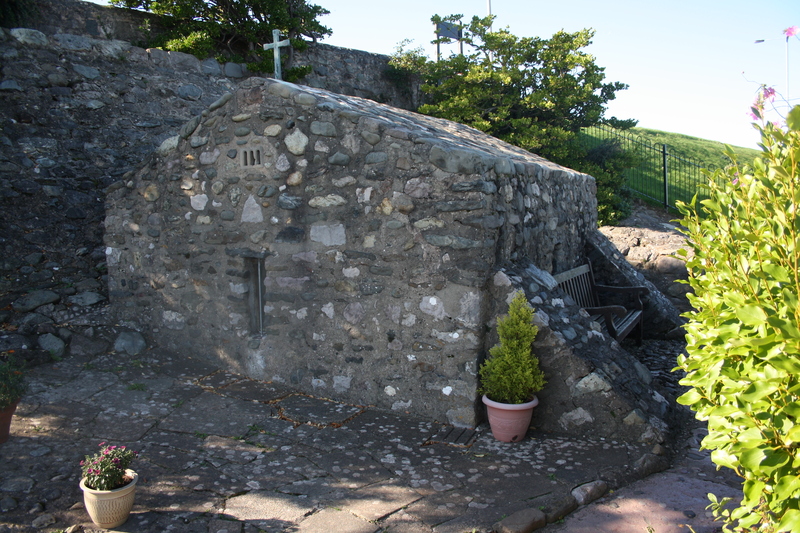 St Trillo’s Well is housed in a tiny chapel almost on the seashore, at the Llandudno end of the promenade at Llandrillo yn Rhos (Rhos on Sea). It is widely held that this is the smallest church in Britain, there are seats for six worshippers. The chapel that stands there now was substantially rebuilt, with new walls and roof at the end of the nineteenth century. However, it occupies a site where St Trillo was thought to have established his first church in the sixth century. 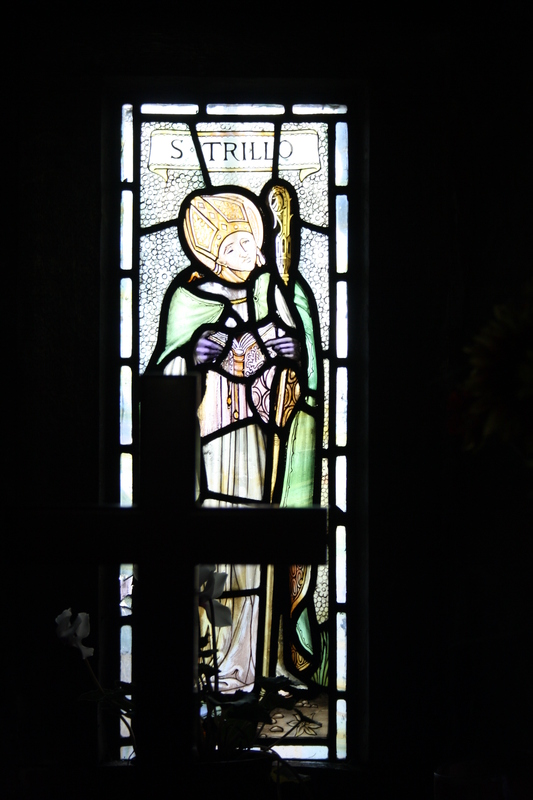 Trillo is said to be the son of Ithel Hael of Llydew and a brother of Saints Tegai and Llechid, both of whom established churches in Caernarfonshire. He was a monk on Bardsey Island before establishing his church at Llandrillo. 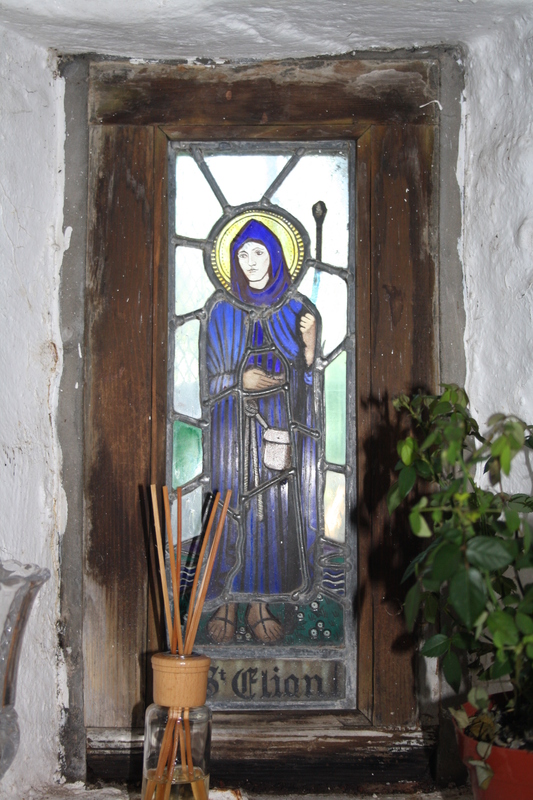 He was a contemporary of St Deiniol of Bangor, and it is believed that he took part in the foundation of the Diocese of Bangor under tha patronage of Maelgwn, Prince of Gwynedd in around 550. 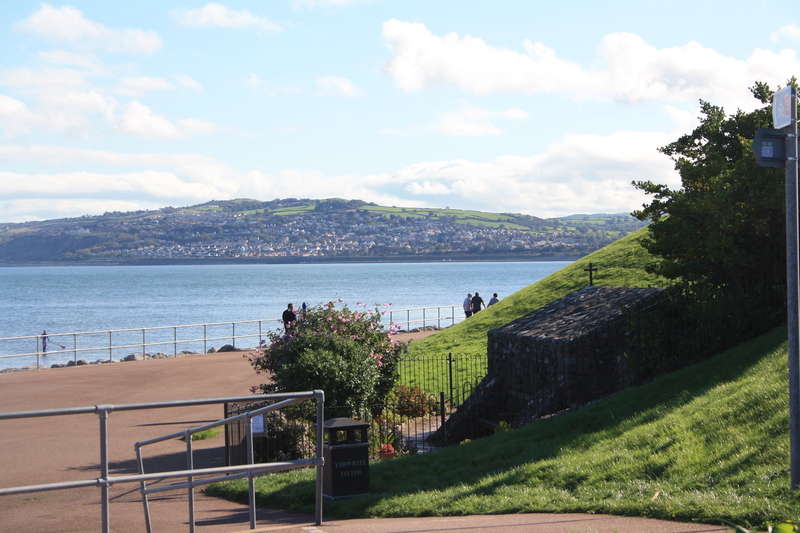 Maelgwn had a castle at Deganwy, and a palace near Rhos on Sea at the site now called Bryn Eurgn, where the remains of a more recent, medieval house have been restored and can now be seen. The well, which is under a grate below the altar, is dedicated to St Trillo and St Elian, who are both illustrated in the small stained glass windows in the chapel. 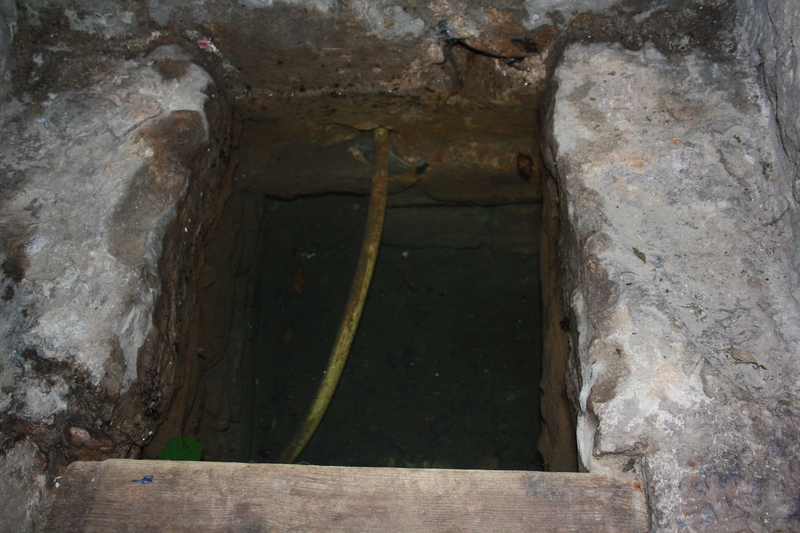 There is no record of any healing properties for this well, although traditionally the water has been taken for use in baptisms at the other churches in the parish. The parish church here is also dedicated to St Trillo, and there is also a church dedicated to St Trillo at Llandrillo near Corwen, where there was also a healing well carrying his name until it was stopped up in the mid nineteenth century. St Trillo’s festival is celebrated on June 15th. There have been other wells in the region dedicated to St Trillo at Llansannan and Llandrillo, near Corwen. Presumably, Llandrillo is named after St. Trillo? 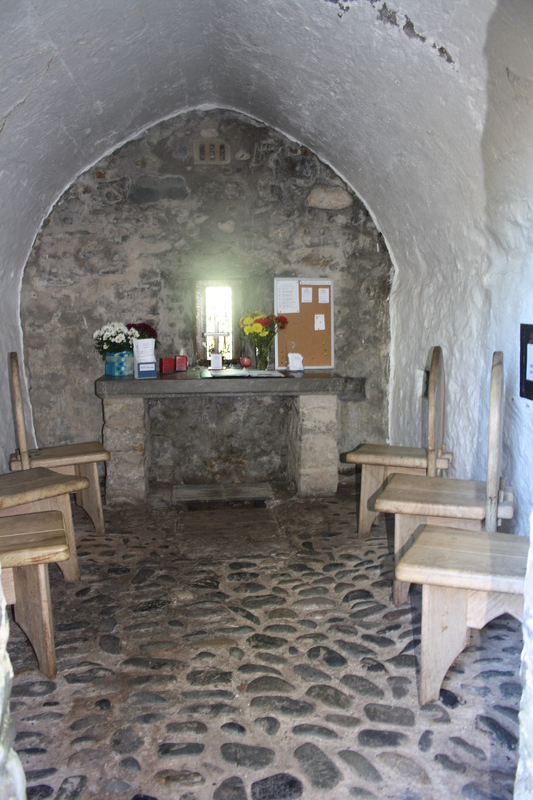 There’s a bit of competition for smallest church in Britain – Cumbria claims it for St.Olaf’s in Wasdale! Although I think, looking at your picture, that yours is smaller. They do look remarkably alike in outline, though. St. Olaf’s roof is said to have been made using timbers from Viking ships – how soon after they landed, who knows! Yes, as in so many Welsh villages , the village is named after the founder of the community. The “Llan” element is generally translated as “church of”, although it would originally have been an enclosed area centred on a church, and “Drillo” from Trillo, with all the complex mutations of Welsh initial letters. It is rare to find wells inside churches, the parish church, which dates from the 13th century at least, is a little distance from this chapel, so I suspect that this chapel has been retained specifically for ceremonies at the well. There are other instances of specific well chapels built beside wells, although few have remain in such good, usable, condition.